As an Online to Offline (O2O) technology platform that connects online merchants with offline customers through a network of agents, Kudo shares Grab’s mission of empowering millions of digital entrepreneurs through technology. Kudo joined the Grab family in April 2017. Find out more about Kudo here (or visit their English page here). Nacitta joined Kudo at the beginning of 2018 as the Head of Digital Product. Now, she has shifted portfolios to become its Head of Commercial & Business Expansion. In carrying out her new role, Nacitta shared her experiences which made her find new meaning in her work. Visiting our agents helped me gain a deeper understanding of what they need. Kudo agents are local sellers who sell products on the Kudo app to those who have no access to the online shopping world. I believe that if we can understand our agents, it would be very good for Kudo to help improve our services. So I decided to meet our agents to understand Kudo business more deeply through those who are on the front lines of Kudo’s business. When I went on the field visit, I met the agent; we called her Ibu Mawar. 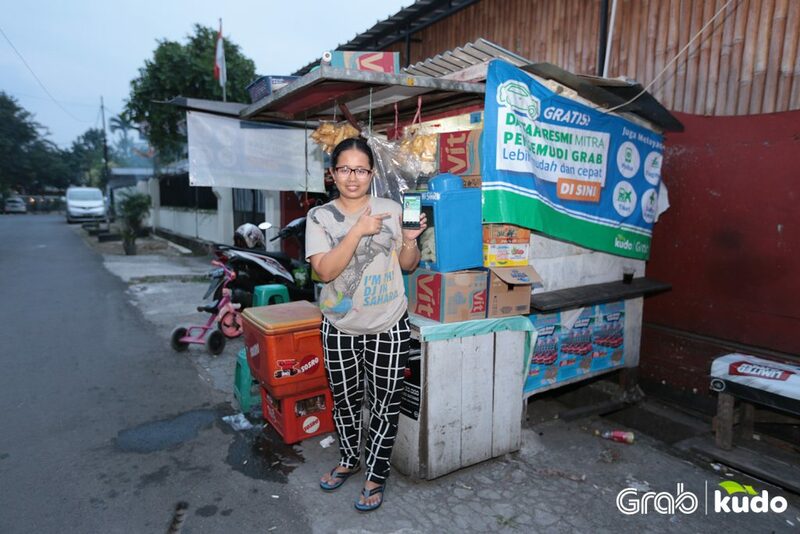 She was told that she only got IDR 100,000 (US$7) per month but she still wanted to be our agent. Why? Because she wants to help others. For her, being a Kudo agent can help others who have difficulties getting what they need online. That gives her big satisfaction. What a great reason! When I knew about that, I felt very excited that Kudo’s mission can also be felt by one of our agents. It becomes a motivation for me. Negative comments from customers and agents are not always a bad thing. In developing new businesses, there are many things that I have to do, such as determining new types of products, budgeting, pricing, and so on. In determining all these things, of course, I have prepared them with consideration, conducted in-depth discussions, and several trials. I really hope that the new product is in accordance with customer and agent needs. But not everything goes according to plan — we still receive some negative comments from them about our new product in the Kudo App. Sometimes, getting a negative comment feels like getting a nightmare. However, I learned that when a customer and agent gives a negative comment, it actually shows that they really need our product. They expect immediate improvement so that their needs can be met through Kudo App. I am reminded of Ibu Mawar, her enthusiasm to help other which is in line with Kudo’s mission is something that must be supported and facilitated. Again, it becomes motivation for me. I’m happy when our work can positively impact others. In Kudo, I am very aware that if any feature in the app unfortunately breaks, life will become difficult for our users. Kudo is a social enterprise. It is not easy to develop Kudo, but because I often work with the customers directly, I realise that Kudo’s app is really important and needed. It makes me excited to handle this. I’ve known what is real impact from what I do. In the beginning, I felt that this was just a job, I sometimes complained that my work was difficult and tiring. But now, I am sure that this job, this business, is indeed needed by the community. Based on those experiences, I found a new meaning in my work. Previously, I felt I only had to be smart and know deeply about the industry to make a good decision in business. What I could sell was my ability to make business decisions. But now, in my opinion, there is one thing that must exist. Every time you do your work, you should do it with all your heart. Ask yourself: are all your tasks done with strong reasons and the right attitude? Because work is not easy. I can see, those who really need these apps are always waiting for new improvements. They really need Kudo’s App features to improve their lives. If you find a strong reason in you and you do this with all your heart, then you will have the drive to keep doing it. Moreover, when someone gives positive feedback resulting from the work Kudo has done, it serves as an additional source of motivation for me. Trust me on this! Interested to join the Grab-Kudo team?